May 2016. A grouping of leading Bordeaux châteaux got together in London recently, each showing four recent vintages – 2012, ’13, ’14, and ’15 – of their grand vin. A most illuminating exercise: every sample showed how each of the châteaux responded to the complex, and unique, set of problems and opportunities presented by each vintage. Here are my impressions from four of the properties. Dark and purplish, the 2012 has a fine, expressive aroma, very nuanced, suggestive of black cherry, blackberry, and peony. There’s a lovely ripeness, with the voluptuous Merlot well to the fore. The vinous flavour, with a core of ripe fruit, is well balanced and wholly free of aggressivity, the tannins being as soft as velvet. Accessible now, it will peak in about 6 years and continue to improve for a further 12 or so. An enticing wine. Dark but transparent, faintly brown, Canon has an expressive, balanced aroma that calls to mind black cherry with stone, peony, and carnation. The chocolaty flavour is stylish, elegant, and medium full. On the day, the acidity is just a bit obtrusive (not so when tasted last, a few months ago); it may simply be a tired sample. The finish is medium long. To drink: around 2020-26. A bit darker, the ’14 has a solid, nuanced look and smells like a meld of damson, graphite, and carnation. It’s a balanced, refined nose with a good concentration of ripe fruit, with underlying distinction. In the mouth, harmonious and grapy, not to say juicy. The grapes were clearly fully ripe, giving a long and complex aftertaste. Very well balanced. An excellent wine that will improve for 20 years at the very least. Black but lustrous, this has a dense, restrained aroma of black cherry and damson jams, blackcurrant, and violet. It smells juicy and voluptuous, so silky I could have taken it for a Pomerol. The flavour is concentrated, balanced, and strikingly pure. A second sip gives access to a lovely structure and richness of fruit so typical of Canon at its best: compact yet expansive, velvety, profound. The tannins are of exceptional ripeness. A great Canon with a good 30 years’ improvement ahead. Most things of beauty – music, architecture, poetry, art – tend either towards the romantic or the classical. The best of all are a fusion of both. That’s the case with this lovely Canon, which fired me to great enthusiasm. Almost black, this has an intense, balanced nose with pronounced Rauzan Ségla character: firm and harmonious, with classic Margaux structure infused with Cantenac velvet. The nose is a meld of black cherry, blackcurrant, sloe, and violet. One sniff is enough to tell you that it’s a wine of balance and distinction. The flavour measures up, expanding to include elderberry and other, still inchoate savours. The acidity, like that in the juiciest black cherries, amplifies the long finish. This won’t show at its best in less than 6-8 years and will improve for a further 18-20. An exceptional 2012. The colour is a shade less dark than the ’12, while the nose, more forward, already shows typical Margaux floweriness, conjuring up iris and peony, blackcurrant, and liquorice. There’s even a hint of nectarine – probably from extremely ripe Merlot. A lovely suave nose, of real distinction. On the palate, delectable ripe fruit: black cherry, liquorice, nectarine, with a sudden flick of raspberry. The aftertaste is long and juicy, with no hint of greenness or ascerbity. An amazing achievement in a tricky vintage like ’13! The colour is vivid but, surprisingly, not as dark as the ’13. The nose is round and very Merlot, exhaling notes of plum jam, cinnamon, purple cherry, and raspberry. A truly globular, harmonious smell. The raspberry element burgeons on the palate, while the flavour grows firmer, more assertive. Good wines always have more to say when given time in the glass and that’s the case here. It quickly fills out, showing lovely red-fruit sweetness, with a hint of strawberry on mid-palate. The finish is long and satisfying and exhibits a harmony more often found in single-grape wines. No doubt accessible young, it really needs at least 8 years to show its full paces and will continue developing for a further 15-20 thereafter. As to looks, you could take this for a glass of crème de cassis (it’s now in its “primary colour” phase). The aroma, as round as the earth, is crammed with myriad incipient scents, including peony, raspberry, black cherry, and violet. It’s a typical Margaux nose, precise, classical, intense, of optimum concentration: a meld of grace and power. How can so multifaceted a nose be so homogeneous? Because all its diverse elements are in perfect harmony. The refined flavour gives off multiple subsidiary savours, the texture is lovely, and the finish very long indeed: volume without thickness, smoothness flecked with graininess. A great Rauzan Ségla. In 1785 Thomas Jefferson (third US President and a great judge of claret), showing great prescience, ordered some of the 1785 vintage of Rauzan Ségla. He wrote to the then owner, Mme Rausan, to say he considered her wine to be “equal to any of the four crops” (the future First Growths of the Médoc, already acknowledged as such, many decades before the 1855 classification). 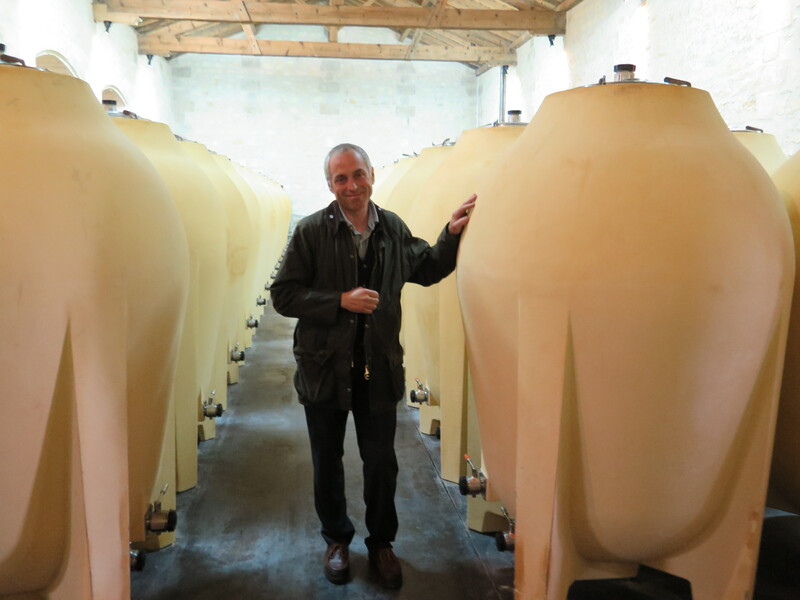 Winemaker Jean-Michel Comme with the ceramic urns, partly made from clay from the Château’s subsoil, in which a large proportion of Pontet-Canet is now matured. Very dark, though with signs of evolution, this has a lovely concentrated aroma suggestive of crèmes de framboise and cassis, liquorice, and truffle, with signs of old-vine density. A tiny fleck of sealing wax is so fugitive it hardly registers. I’m immediately struck by the lovely texture on the palate with that special sweetness only found in wines from wholly mature, healthy grapes with no overripeness. Raspberry, blackcurrant, liquorice fuse together in the mouth to produce a velvety, even caressing texture, with a subtle hint of truffle in mid-palate. The tannins are very ripe. This would go superbly with roast pigeon. The nose is more evolved than that of the ’12, if a shade less nuanced. Ripe plum and damson scents can be detected on the round, sweet aroma that promises medium body but good balance. Plum and damson notes can also be picked out on the palate, with a suggestion of sweet prune. Make no mistake: this is built to last. The flavour, liquorice wood and clove now showing, proves to be long and probing, the finish nuanced. Though drinkable young, this won’t give of its best in less than 6 years and will continue to develop for a good 15 or so more. This dark wine has a weighty, distinctly Pauillac aroma of chocolate, black cherry, cigarbox – an arresting blend of power and classic restraint. The multiple scents dovetail beautifully – a sign of what the French call “un vin charpenté”. The full, vinous flavour has an all-encompassing quality, being voluminous and profound. The ripe tannins provide all the structure that’s needed to counterbalance the ample fruit. This is the most structured Pontet-Canet so far, a true Pauillac good for at least 30 years’ evolution. Like the other three ‘15s, this is an opaque black-purple with glittering crimson highlights. The nose is strikingly intense, and even if it’s very closed up, you can’t fail to register the wine’s phenomenal concentration and complexity. There’s a vast presence of richly concentrated fruit, Cabernet-Sauvignon to the fore, with a wealth of Pauillac weight and energy. Dominant aromas at this stage include crème de framboise, blackcurrant, liquorice, peony, damson. In the mouth the wine shows great substance but no thickness. As with the aroma, the flavour is still very closed up but you can sense the presence of multiple subflavours with the kind of refined earthiness, and fine minerality, typical of great Pauillacs. The aftertaste, not yet fully defined but clearly harmonious, rolls on and on. This will improve for a half-century. A great Pontet-Canet. Very dark, this Saint Julien has a highly aromatic, aerial aroma of real finesse. Flowery, it smells like black cherry, graphite, sloe, with a date-like density at the centre. A splendid nose, with characteristic Saint Julien grace and refinement (I find myself thinking of Rauzan Ségla). On the palate, which verges on voluptuousness, hints of damson, black cherry, fig, and truffle. The vinous flavour is medium long with fine-grained tannins. Just bit blunt on the finish but very good indeed. Should improve steadily over the coming 20 or so years. A solid black-purple, this has a glossy, vinous aroma suggestive of peony, carnation, cherry, raspberry, and graphite. It’s an expressive scent promising good balance and length. That promise is fulfilled on the palate, where the flavour is enhanced by a fugitive hint of cinnamon from the medium-toast oak. The very clean, sustained aftertaste promises some 20 years of improvement. Darker and more viscous, the ’14 has a full, expressive aroma of blackcurrant, crème de framboise, peony, and purple rose. It’s a very precise nose, the sure sign of meticulous wine-making. Masses of ripe fruit on the palate, with one flavour succeeding another, all coalescing into a unified whole: plum jam, clove, chocolate. At present, the effect of toasted oak – a higher level than in the preceding two vintages – introduces a faintly cosmetic element but I’m pretty sure that will retreat over time. Au fond a solid, balanced wine that should show best around 2015-30. Like the other ‘15s, this is a near-opaque black-purple. The aroma is rich, weighty, and all of a piece, with an almost Saint Estèphe assertiveness. A plethora of ripe black fruits and berries spring to mind; but if the aroma has lift it doesn’t have quite the complexity and finesse always to be found in, e.g., next-door Léoville Las Cases. Not at this juncture anyway. The flavour, very emphatic, is rich and oaky, filling the mouth with super-ripe fruit. At present it has almost the volume of a vintage port, without being in any way spirity. Every good wine shows differently at intervals, even from day to day, in accordance with its inner workings. That’s obviously the case here. It’s a superb wine; it’s just that it doesn’t sing at this particular moment.